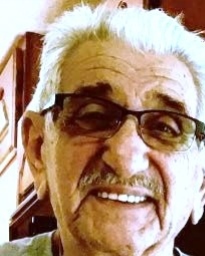 Santo P. Sanguedolce, 87, of Methuen, passed away Tuesday, March 26, 2019, at Holy Family Hospital in Methuen surrounded by his family. Born in Lawrence on October 28, 1931, Santo was the son of the late Filippo and Santa (Romano) Sanguedolce. He was the husband of late Pauline M. (Correnti) and father to his late son, James. Raised and educated in Lawrence, Santo was the owner of Dolce’s Restaurant and Catering for many years. In 1985, he became the Superintendent of Lawrence District Court until his retirement in 2002. Santo proudly served our country in the United States Army during the Korean War and was the recipient of the Purple Heart, the Korean Service Star with Five Stars, the Combat Infantry Badge, the Presidential Unit Citation, and the United Nations Ribbon. Well known throughout the Merrimack Valley for his baking, Santo was especially known for his pies at Thanksgiving and for his morning coffee rolls, muffins, and doughnuts. He had an infectious charm, a quick wit, and loved to laugh. Santo loved working in his vegetable garden in the summer. He enjoyed music and was devoted to his wife of sixty-six years, whom he loyally cared for many years prior to her recent death. Most of all, he loved his family. Known as Dad, Papa, Great-Papa, Santo was so proud of each and every one of his family members. Santo will be deeply missed by his son, Dr. Phillip Sanguedolce and wife, Janet, of Meredith, NH; daughters, Sandra (Sanguedolce) Desrosiers and her husband, Leonard, Paula (Sanguedolce) Hartt and her husband, Michael, all of Methuen; grandchildren, Jesse Sanguedolce and his wife, Eveleth Greene, Micah Sanguedolce and his wife, Manisha Khadka, Lisa Desrosiers and Richard Smith, Jaime Tine and her husband, Frank, Nicholas Hartt and his wife, Mariana, Brandon Hartt and his fiancée, Katie Achilles; great-grandchildren, Savannah, Bella, Vivianna, Talia, Amaya, Maisy, and Marston; and several nieces and nephews. He was predeceased by brothers and sisters, James, Sebastiano, Benedetto, Frank, Anthony, Orlando, Mary, Rose, and Sebastiana. Family and friends are respectfully invited to calling hours on Monday, April 1, 2019 from 4:00-8:00 PM at Cataudella Funeral Home, 126 Pleasant Valley Street in Methuen. A funeral mass will be held Tuesday, April 2nd at 11:00 AM at Our Lady of Good Counsel/St. Theresa Church, 22 Plymouth Street in Methuen. Burial will follow at St. Mary/Immaculate Conception Cemetery in Lawrence.